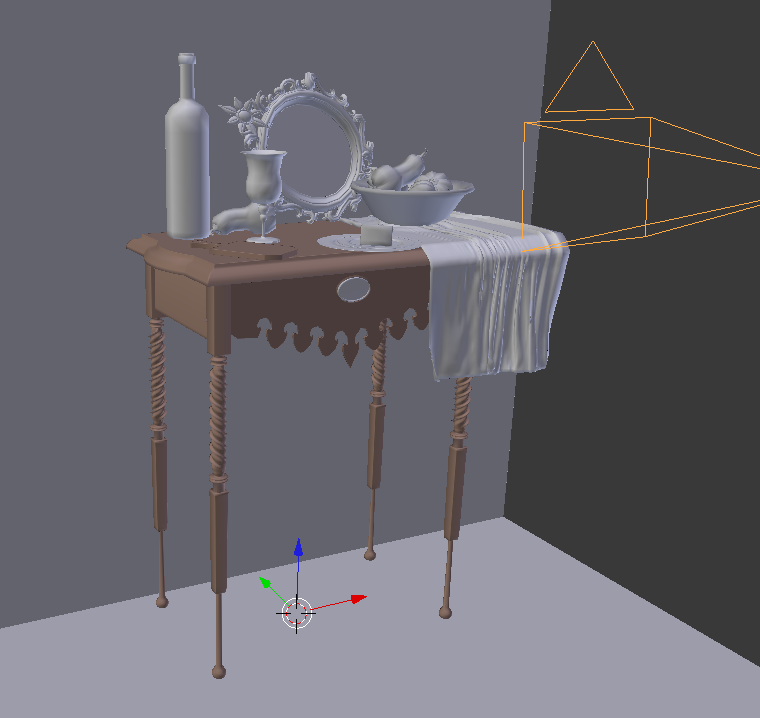 A big problem with 3D is that, when making a composition, you can change the size and shape of things infinitely. Something too small? Scale it! Found a nice angle while zooming with your camera? Change the view! To contrast this, when you’re drawing or painting you eventually commit to your easel’s placement, and you can’t magically make your bowl of fruit bigger or smaller. Additionally, you almost certainly worked on a tiny detail, and thus it breaks your heart to see it cut out of frame. Ego makes you want to emphasize each detail. Everything gets emphasized, therefore nothing gets emphasized, and your composition suffers. 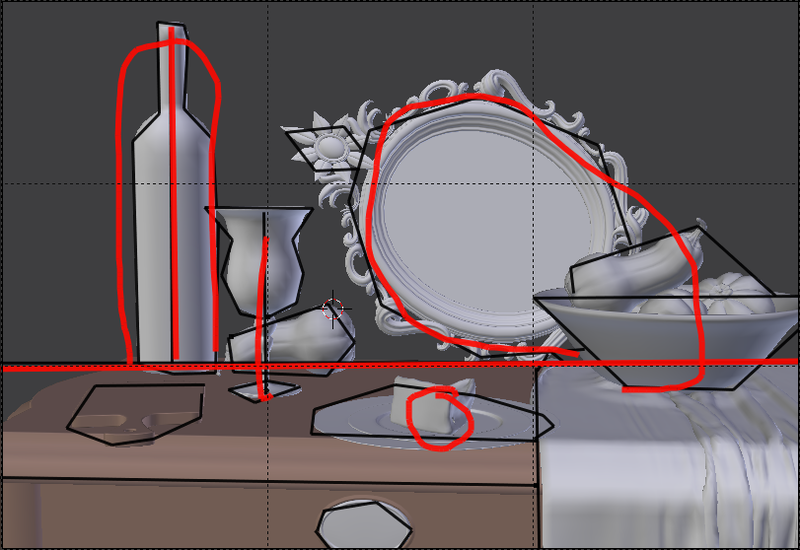 Blender’s grease pencil can give you a handy fix for that. Observe this WIP scene. 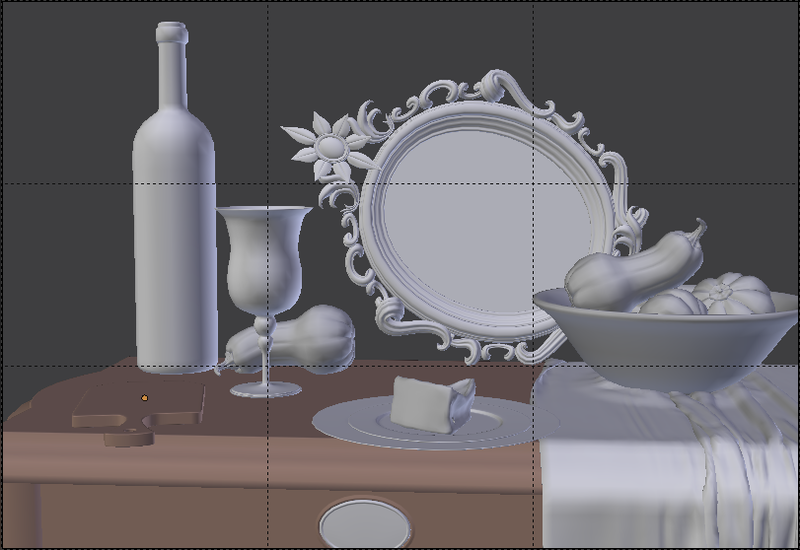 I knew I wanted a close-up still life, but started by modeling all the individual components. Hey, look! My table has cool legs and filigree! The urge is to suddenly break my original goals, to jam that extra detail into the shot. Eschewing the unnecessary, I compose the camera for a much tighter angle. I’m combining several composition ideas here: Thirds (set in the camera settings under composition guides), steelyard, negative space between the wine bottle and goblet, blah blah blah. But I’m also attached to minor modeling details I’d concocted! Grease pencil can let you study your composition objectively. 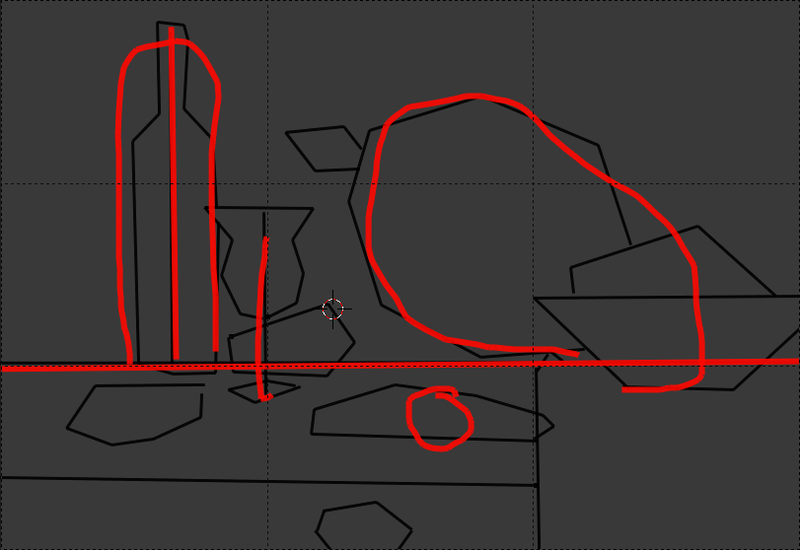 If you’re new to grease pencil in blender, its lets you draw on top of your screen, and is handy for note taking, live demos, and even asset creation by converting strokes to curves. D + Right Mouse Button: Enters a grease pencil session, where Left Mouse Button adds a new point and Right Mouse Button exits this mode. You can edit grease pencil settings in the 3D view’s properties panel, toggled with N.
I drew two grease pencil layers: the thicker red layer to highlight the primary sense of balance, where main objects balance on a fulcrum, and the thinner black layer to mark meaningful shapes. If the table cloth adds to the equation, it’s far too unbalanced. Thus, the table and tablecloth should be similar in color to meld. Details like the cutting board (and its hitherto unmodeled contents), the table inset, and the butternut squash behind the goblet should be less emphasized. The mirror model came before the composition. Changing it to be broad rather than long would let it be hung behind the fruit rather than rested. This will also allow for a downward “hanging” tilt, thus reflecting the fruit, and thus unifying them as a shape. Thirds isn’t the primary goal, but enough thirds lines are emphasized to further alleviate the composition.